Its a big time pleasure to have a meal starting with a warm soup to a nice cold dessert. Sweet corn soup is famous to be a favorite of lots. I am no exception. I just loveeeee sweet corn soup. Here you go for the simplest recipe to make a very tasty soup. Pressure cook or microwave the corn kernels till tender. Keep aside some corn kernels for later use. Grind rest of the cooked corn adding some water to it. Cook the ground corn in a pan on medium heat. This quantity would suffice 3 servings. Hey Nithya, Sweet corn soup ennoda favourite..en eppadi tempt pannarengha evlo attractive pictures ellam pottu.. Awesome Soup! Love the rich and creamy texture! Sweet corn soup looks really good. 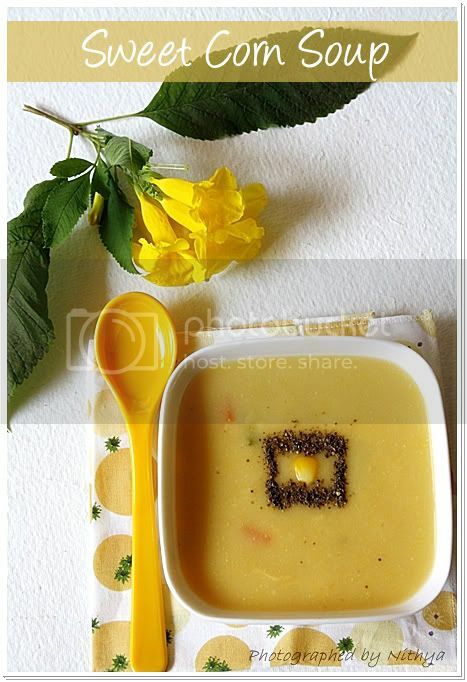 delicious and healthy soup..kools yummy..Nice click to.. The soup is surely one of my favorites too and love the texture. My fav too... yummy and good to have in this weather... nice clicks as well. 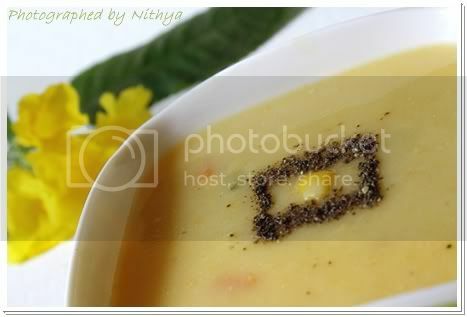 Slurppp, sweet corn soup looks fantastic Nithya...yummm!! Lovely clicks as always ...yummy Soup! Awesome presentation and pics!! 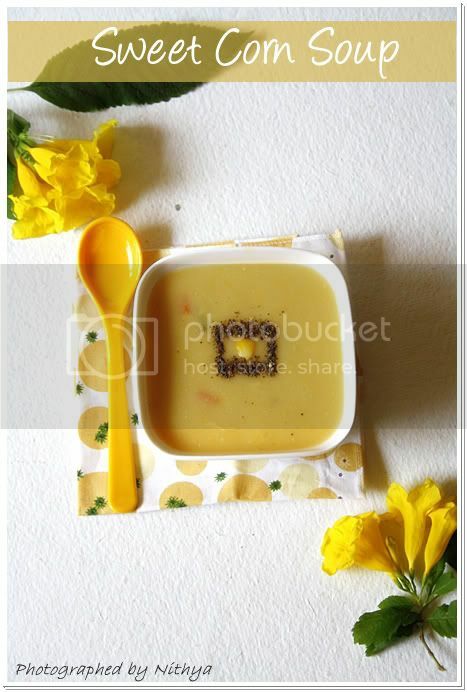 Sweet corn soup looks really tasty..
Sweet corn soup is my all time fav...luks very creamy. Looks soo Yummy and tempting....its my favourite soup. Like the yellow theme in your pics. Soup really looks comforting. simple and easy soup... great clicks and presentation..
What a tasty and healthy soup. Looks so creamy. Very well decorated and great pics. Already started slurping in front of my monitor. Hey, Nithi, Loved your photos! !, They are so gorgeous! !, I love sweet corn soup! !, looks so yum!! Wow! Love the new layout. Very nice indeed! Weet corn in any form me likey...so luv this also...neat presentation as usual! So I can now say that Nithya has become a great cook. Can't I? Delightful soup dear and lovely presentation! Corn soup is one of my favourites. Gonna try this recipe out soon. This is one of my favorite soups and looks super yum! Nice presentation! 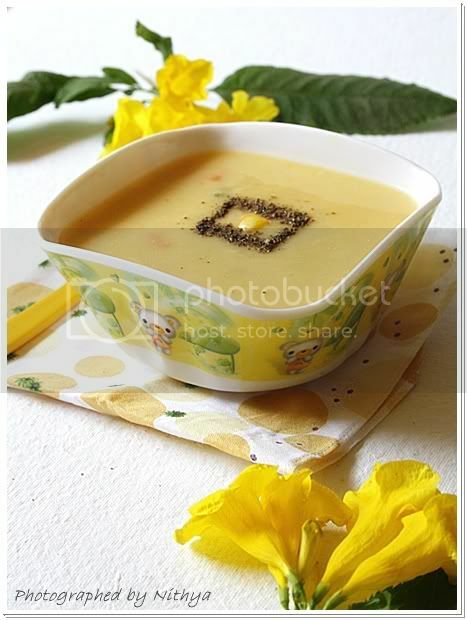 sweet corn soup looks delicious. i used to prefer adding the sweet corn in fried rice..liked the taste. i am adding u in my blog roll. Have been checking out all the YUMILICIOUS recipes on your blog past few days. I am loving the photography and the food presentation and am dying to try quite a few recipes from your blog. I have one lame question about this recipe. When you say 1 Corn Cob. Would you please tell me approx. what measure that is? Is it like 1/2 or 3/4 or 1 cup corn. Thanks once again... I am hoping to try out this recipe tonight. The soup looks so great! Thank you for sharing!